Looking to create a survey in WordPress? Surveys are a perfect tool for gathering information in order to make informed decisions. Visitors can tell you their opinions with the click of their mouse, giving you the data you need to drive your business forward. In this article, we’ll teach you how to create a survey in WordPress the EASY way, and how to get reports on the data you gather. Choosing a survey-making tool can be a real pain. There are so many third-party online services that allow you to create embeddable surveys, and yet they all have major downsides. Whether it’s the fact that your reports are stored on their hard-to-access third-party servers, the frustrations of limited customization options, the limited number of responses you’re allowed, or the high monthly costs… These third-party survey forms just aren’t up to snuff! Now’s the time to remember: you have WordPress. Why not use a plugin? Better still, why not use the best WordPress survey plugin on the market? In fact, if you’re a longtime reader, you may already have the plugin we’re talking about. We once said it was the best contact forms plugin for WordPress. We’re talking about WPForms, of course. Thanks to its recently-added surveys and polls addon, you can now create gorgeous customized surveys with the easy-to-use drag and drop builder the plugin is known for. Pretty cool, right? We think so too. So let’s get started! If you haven’t already, you’ll need to install and activate the WPForms plugin on your WordPress website. 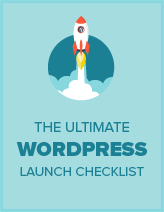 If you need help, check out our guide on how to install a WordPress plugin. Once your newly-installed plugin is activated, you’ll need to enter your license key by clicking on WPForms » Settings from your WordPress dashboard. 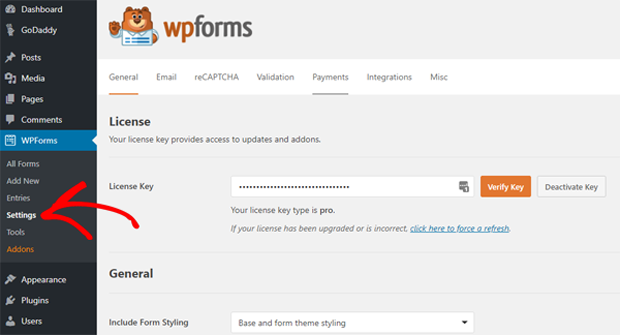 Your license key can be found on WPForms’ website in your Account section. Next, click on WPForms » Addons from the left-hand sidebar of your WordPress dashboard. Scroll down to the Surveys and Polls addon. Click on the Install Addon button, then, once installed, click Activate to begin using the addon. Head over to WPForms » Add New to begin building a new form. You’ll be greeted with WPForms’ famous drag and drop interface. Give your survey a title, and then click the Survey Form template. This will load up a sample form template for customer feedback, complete with several fields already pre-added to the form. Click on any field to edit it. Feel free to rearrange the fields with the intuitive drag and drop builder, or remove them completely. Up to you. You can also add additional form fields from the left-hand column. You can also add on radio buttons, checkboxes, drop down options, a rating scale, or pretty much anything else you could ever desire. Have fun with it! Using conditional logic, WPForms has an option for you to personalize your survey questions based on what the user input in a previous field. If you’re looking to make your survey highly-advanced, this is the option you should play around with. Once you’ve created your survey form, click on the Save button to save your settings. All done? Go ahead and click the Close button to exit, and move onto the next step. Unlike other plugins, WPForms makes it incredibly simple to add our forms to any post or page on your WordPress website. You can even add your survey to your sidebar, or choose to have it shown on custom post types. To add your survey to a post, page, or post type, visit the post’s edit screen and click the Add Form button. A popup will appear that’ll allow you to select your survey form. Click on the Insert Form button and watch the magic happen. Viola! A shortcode has now been added into your post editor. You can put it anywhere you like within that post / page. And, once you’re done editing your content, simply hit Publish, and the survey form will be live and ready for action. Prefer to have your survey appear on your sidebar? No problem. You can plop that sucker into ANY sidebar or widget-ready area. Just head over to Appearance » Widgets from your WordPress dashboard, and then drag and drop the WPForms widget to any sidebar you like! Select your survey within the widget’s settings, and click Save. That’s it. You now have a survey form displayed on your website’s sidebar. To view your survey form’s results, you’ll need to click on WPForms » All Forms and click on the Survey Results link underneath the form you’re interested in. From there, you’ll see some gorgeous graphs and charts displaying your results. You can also export these into a spreadsheet program, or print them, if you’d like. From the top of the page, you can click through different chart types and explore the export options. You can save your survey results as PDFs, JPEGs, or other printable formats. This comes in really handy if you want to add them to blog posts, slide shows, or share them on social media. 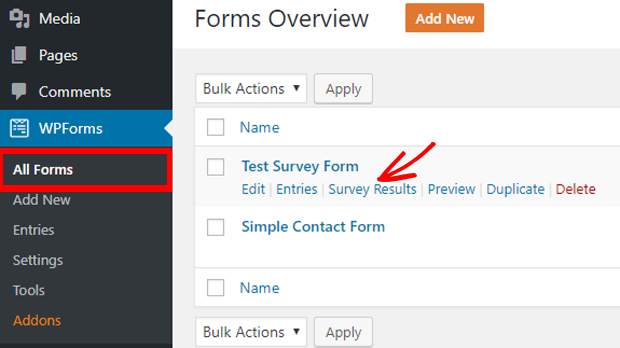 Using WPForms, you can do more than create a survey in WordPress from scratch. You can also turn any existing WPForms form into a survey. 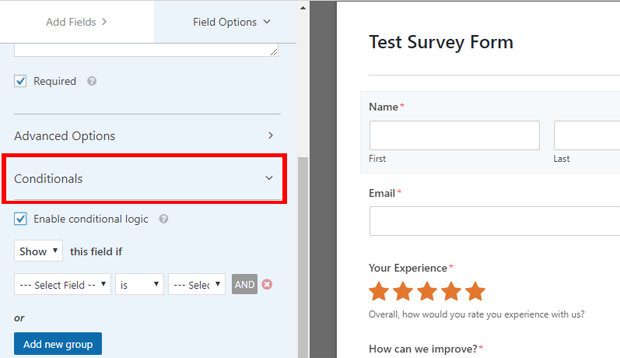 You can even select which form fields you want to be treated as survey fields. Why do this? Because it’s a great way to gather data. Suddenly, newsletter signup forms, contact forms, and user registration forms become powerful information gathering tools. To convert an existing WPForms form into a survey, edit the form and then head to Settings » Surveys and Polls. Then, click on the box that says Enable Survey Reporting, and hit Save. Prefer to enable survey reporting on an individual form field rather than the entire form? Just edit the form, and click on the field that you want to enable. 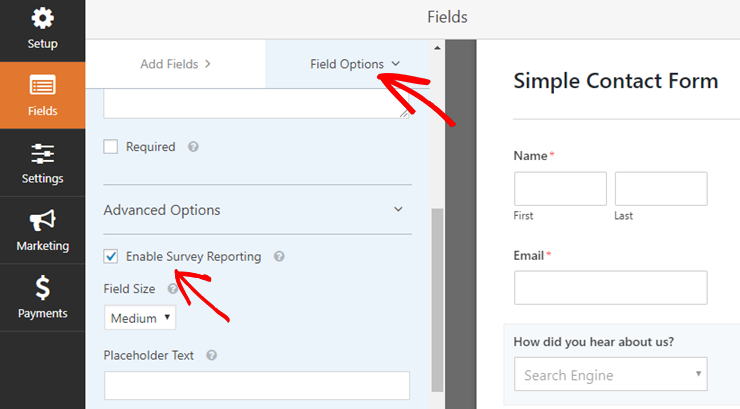 Via the Field Options section on the left-hand side, click on Advanced Options and check the box marked Enable Survey Reporting. Easy-peasy! We hope this article helped you learn how to create a survey in WordPress. Looking for more ways to gauge user interaction and gather important data? You might enjoy reading our step-by-step guide on how to add Google Analytics to your website.